The Malkin Bowl (Marion Malkin Memorial Bowl). 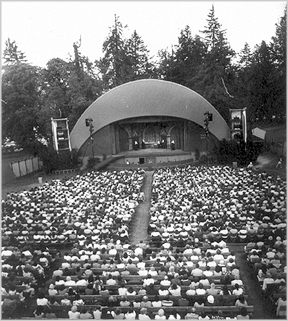 Outdoor theatre built in 1934 in Stanley Park, Vancouver, as a two-thirds-size replica of the Hollywood Bowl. W.H. Malkin, a former mayor, endowed it in memory of his wife. Designed as a band and orchestra shell, it opened 8 Jul 1934 with a performance by the Vancouver Symphony Orchestra, which gave many summer concerts at the site up to the 1950s. It became the home of TUTS in 1940. In 1952 the stage was modified to its present dimensions, 12.3 m wide at the front, 7.8 m wide at the rear, 13.8 m deep, 6.18 m high at the centre, and 5.1 m high at the sides. 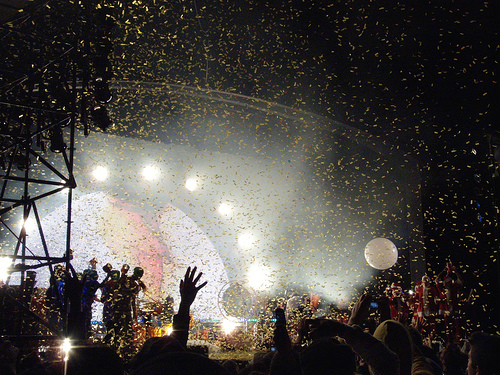 The surrounding grounds have accommodated up to 12,000 people. On 16 Jan 1982 there was a fire in the building, possibly the result of arson, but repairs were possible and in 1989 it remained the home of TUTS.